Every period of literary history has its share of bawdy, satirical poetry, from Mesopotamia, to Rome, to the age of Jonathan Swift. Every period, it often seems, but one: The late Victorian era in England and America often appears to us like a dry, humorless time for English poetry. Two of the most renowned poets, Alfred Tennyson and Henry Wadsworth Longfellow are, fairly or unfairly, viewed as wordy, sentimental, and didactic. At the dawn of the new century, tough-minded modernists like William Carlos Williams, Ezra Pound, and T.S. Eliot remedied these failings, the story goes. And yet, despite their symbolist influences, these would-be radicals can seem themselves pretty conservative, turning Tennyson and Wadsworth’s affirmations of an ordered world into maudlin, and reactionary, laments over its loss. Eliot’s work is especially characteristic of this high church disdain for social change. Eliot, writes Mental Floss, was “stodgy.” Adam Kirsch in Harvard Magazine writes of Eliot’s “almost papal authority in the world of literature” and his “magisterial criticism”—hardly descriptions of a revolutionary. “Looking at the severe, bespectacled face of the elderly poet on the cover of his Complete Poems and Plays,” writes Kirsch, “it is hard to imagine that he was ever young.” But young he was, and while always pedantic in the most fascinating way, Eliot was also once a writer of very bawdy verse. He was also, unfortunately, a composer of racist verse, a fact which many readers of Eliot will not find overly surprising. Mental Floss quotes from one of those ugly early works, featuring “the racist caricature of a well-endowed ruler named ‘King Bolo.’” But it also quotes from an early poem said to contain the first use of a word that aptly describes the language in that first distasteful poem. According to Language Log, a site maintained by University of Pennsylvania professor Mark Liberman, who source their etymology from the Oxford English Dictionary, the word “bullsh*t” originated with Eliot's poem "The Triumph of Bullsh*t."
Quite innocent - "he only wants to make shiver us." “The Triumph of Bullsh*t” functions as a bratty riposte to Eliot’s critics. (It was, in fact, originally addressed to “Critics,” then changed to “Ladies” in 1916.) 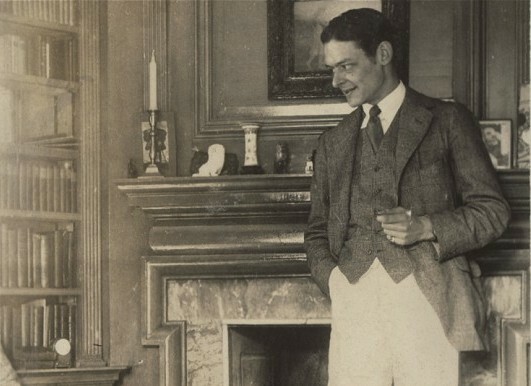 Language Log questions whether Eliot “really invented bullsh*t in 1910,” since he "could hardly have aimed to shock the ‘ladies’ by naming his little poem ‘The Triumph of Bullsh*t’ if the term had not already been a commonplace vulgarity.” Perhaps. But according to Wyndham Lewis and the OED, he was the first to use the word on record. Harvard Magazine’s Kirsch calls these early poems (collected here)---and others such as the profane “Inventions of the March Hare”---the last manifestations of the “American Eliot” before he went off and became the “British Eliot” who would not deign to utter such vulgarities so freely. In difference to Mental Floss (which I’ve recently blocked because of their inept reporting of science related topics), T.S. Elliot is hardly “stodgy” given the time period—1915. Elliot remains brilliant, provided one has any respect for the historical context of his literature and poetry. Sigh. Over and again, the first recorded use is not the same as invention. anon dowson: Yes, it must be exasperating to have to go around comment sections repeating points that were already raised and discussed in the original post. @ JSintheStates: “In difference,” is an awkward phrase. It doesn’t make sense. Do you mean “In disagreeing with”? If you mean “in deference,” which is what I think you mean, it is the wrong usage of the word. “Deference” means “respectful submission to another,” or agreeing with someone. “In difference,” is an awkward phrase. Maybe you mean “In disagreement with.” But I’m thinking you mean “In deference to,” which is also an awkward use of the word which usually means “respectful submission or yielding to the judgment, opinion, will, of another,” which is not what you’re doing by disagreeing with them. First use in print on record is not the same as coining the term. Eliot was born and grew up in Missouri, where the term was (as you can imagine) common long before the twentieth century.